Success of our partners and customers is our success. "Wiko-Ukraine" uses in its work advanced methods of the goods delivery. We cooperate with courier services, transport companies, which guarantees fast and timely delivery of goods throughout Ukraine. For convenience of the customers delivery methods are individually selected for each group of goods. Payment for goods and services is made through a bank. Who is the manufacturer of all goods presented on the web site? We are the manufacturer of ALL the goods presented on the web site. Buying goods and services from us you get the optimal price-quality ratio and the goods from the manufacturer. Nowadays retail equipment is rapidly developed and improved. It applies above all to shelving designs. The production now combines efficiency and functional performance of advanced materials as well as appearance. These factors without doubt have a positive effect on the sale volumes of the goods. Choosing equipment for your store you need to pay attention to the following features of the material from which the shelves are made: strength, design, structural stability, quality. 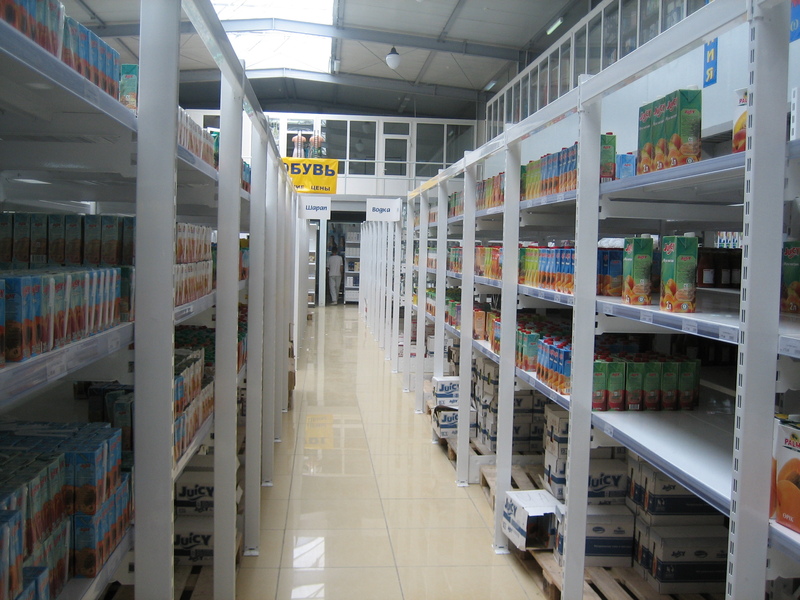 Undoubtedly, metal shelving structures are more suitable for shop windows, as they are fireproof and durable. They are much less likely to bend or break. In addition, they are safer than plastic or wood products. Another advantage: strength and durability. Besides, present-day structures can be quickly assembled, disassembled, and transported. Correct choice of metal retail shelving can only be made after careful research of the market. We advise to take into account warranty periods, particular features of operation, maintenance and installation directly in the retail facility. To buy optimal retail shelving you need to consider all its features. This retail item is divided into two main groups: branded (special) shelving and multipurpose shelving. Special shelving is designed for specific type of goods, the multipurpose shelving, according to the name, may be suitable for a wide range of products. • perforated shelving (there are holes for hooks in the back walls of the shelving). Proper choice: what are its advantages? Properly selected shelving is a key factor for optimal use of the space and efficient operation of the entire retail room. In this case you will not only save space but will display products with the maximum convenience for customers. One should also take into consideration special features of the shopping area and the type of the goods sold. For example, in small boutiques and shops it would be reasonable to use corner and wall shelving, while in large shopping centers double-sided shelving looks good. Ideally, these units should address a large number of tasks (both practical and esthetic): be durable, go well with the goods and fit into the interior. Types of shelving designs that can be easily modified are currently the most popular. Using them the staff of the store can easily change location of the shelving fixtures, holders or change design thereof. Do not forget to pay attention to the size of the shelving, its material and strength. But the most important: decide what functions this equipment will have to perform. You can choose retail shelving on our website or order equipment according to an individual design.